Inspiring homeowners to create beautiful spaces throughout their interiors, Ernie&apos;s Carpets, Inc. in Campbellsville, KY, offers complete flooring services. This family owned and operated company is dedicated to exceeding your expectations with stunning products, affordable prices, and exceptional customer support. From selection to installation, these experts will guide you through each stage of the design process. Whether you’re replacing your worn-out carpet or updating your kitchen with breathtaking hardwood, this local flooring contractor has you covered. 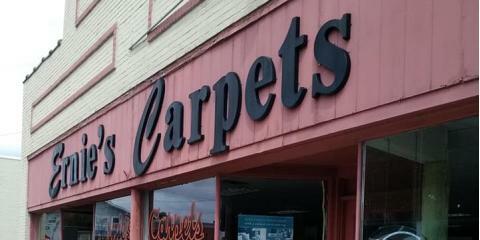 They carry the latest styles and finishes on the market, including stylish carpet, hardwood, and luxury vinyl tiling. You can look forward to working with knowledgeable staff members to create a unique design for your home. After you decide on the right product, skilled installers will promptly arrive at your home to lay new flooring. For added protection, these specialists carry an inventory that features durable materials with worry-free warranties. Don’t hesitate to ask staff members about carpet cleaning services and discounts on select items. When searching for a dependable flooring contractor, reach out to the friendly team at Ernie&apos;s Carpets. Call them today at (270) 465-2827 to request a free quote or visit them on Facebook for more information. Reviews for Ernie&apos;s Carpets Inc.